Glitter Crunch Box: Holiday shopping all year long - Susan Said... WHAT?! It may be January, but I start planning for next Christmas the very instant that this Christmas is over. So, on every spring break, summer vacation, and business trip year ’round I am on the hunt for unique ornaments and fabulous gifts to tuck away. Recently, however, I discovered Glitter Crunch Box, which does the shopping for me, with a box delivered right to my door. Glitter Crunch Box is the subscription box service for Christmas ornament collectors and Christmas enthusiasts in general. Each box is packed to bursting with between five and seven amazing items, all of which are all curated around a central theme. While Glitter Crunch Boxes are sold via monthly subscription, individual boxes may also be purchased. Not only is this the easiest holiday shopping you’ve ever done. It’s also some of the most cost-effective. Each Glitter Crunch Box has an estimated retail value of between $120-150. But, each box will only cost you $59! Beautifully packaged, a themed box would make a wonderful gift for shipping to your far flung relatives and friends (no wrapping required). I guarantee that the recipients will be delighted with the contents. So, what’s in a Glitter Crunch Box? The Honey Box is a perfect example. 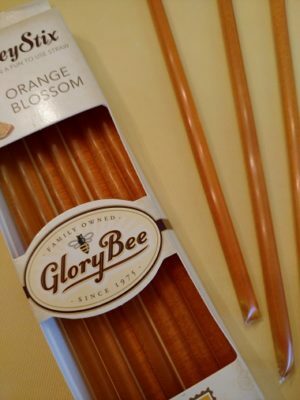 It includes delicious honey sticks and a jar of Habanero honey, as well as beauty essentials such as honey lip balm, hand sanitizer, lotion and wonderfully fragrant French milled soap. Best of all, the box includes not just one, but two, stunning ornaments. 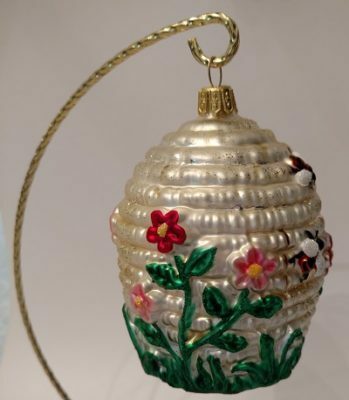 The hive (pictured above) has so many colorful flowers and bumble bees, I use it as a spring / summer decoration on a showcase stand, in addition to hanging it in a place of honor on the tree, come December. 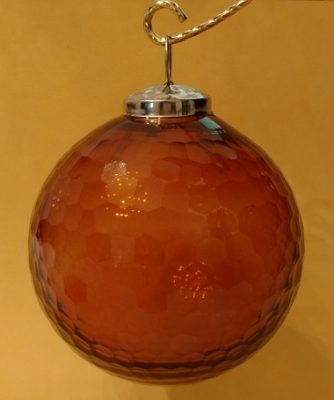 The oversized honeycomb, shown below is another stunner and has a beautiful amber glow and hundreds of facets which catch and reflect the light. The folks at Glitter Crunch Box partner with top designers in the Christmas industry to create exclusive items, made either in the US or in Europe. Like the two I’ve highlighted, the ornaments are all hand crafted, blown glass ornaments with a charming Old World aethetic. And, the Honey Box is just the start. A few of my other top picks include the Coffee Box which contains an exclusive “Coffee Crunch” Coffee Cup Ornament, two Inge-Glass Dark Roast Coffee Bean Ornaments, Vienna Coffee Co. 12 oz. Coffee Bag, Vienna Coffee Co. 2 oz. Coffee Sampler and K Cups, Sensational Sweets Chocolate Chai Chippers, Good Earth “Kitchen Kleen” Soap, and Wheeler’s Cappuccino Pecans. It’s perfect for the coffee lover on your shopping list. Or, you might want to try the absolutely adorable Bacon & Eggs Box which includes an exclusive Joy To The World Collectibles “Pig with Fried Egg Bandana” ornament, a Bacon Strips ornament, Two Left Feet “Sunny Side Up” socks, a concrete “Hatched Egg” pot, Curley Tail Sweet Brown Sugar Candied Bacon, and Curley Tail Smoked Habanero Candied Bacon. Glitter Crunch Boxes are a wonderful way to build a high quality ornament collection that is filled with pieces that are sure to become treasured family heirlooms. My advice? Don’t wait for holiday “crunch time.” CLICK HERE to visit Glitter Crunch Box today! DISCLAIMER: No financial compensation was received in exchange for this Glitter Crunch Box post. 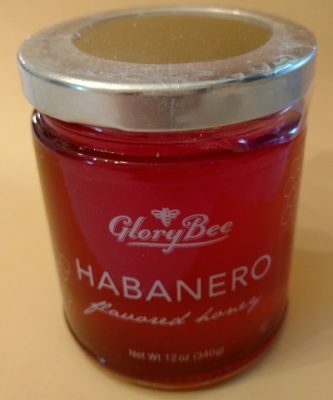 I did, however, receive a product sample of the Honey Box in order to fully evaluate the product and provide honest feedback. Regardless, I only recommend products or services that I believe will be beneficial for my readers.